I’m feeling more than normally muddle-headed tonight, for a whole bunch of reasons. I guess having woodburning stoves installed, and a fireplace opened up, and being more or less amateurish when it comes to brick-cleaning acids, and patch-plastering, and getting the hang of a chain saw, and exploring the capacity of a new long-handled axe…that sort of thing…has contributed. I know that I’ve been confusing my planning for guests on future cobweb strands with planning for guests on next year’s programme at The Puzzle Hall Poets Live, and thereby confusing various friends. So, if this week’s web-strand turns out less coherent than you and my guest deserve, then mea culpas in advance. I think the best thing to do is to say what I plan to riff about, before I introduce Roy Marshall to you, and then cross my fingers that I stay on the right page of the hymnsheet. Two things on the agenda, then. One will be the business of where a writer is ‘located’, what you think of as ‘their place’. The other is the way in which a poet’s collection defies you to pigeon-hole or categorise it. With luck, we may even nail down a connection between the two. The first issue is that of ‘landscape’. This lodged in my mind last week, probably because I’ve spent a lot of time of late reading Robert Macfarlane on the language of physical, topographical landscape, the iconographies of place. The poet Lindsey Holland put up a short post on her Facebook page about teaching the first session of her undergraduate course on ‘Poetry and Place’. I immediately felt envious. I wanted to be a student on the course, and I simultaneously wanted to teach it. I wanted to proselytise about Raymond Williams and the shifting meanings of the ‘country’ and the ‘city’, of the urban and of the pastoral. I wanted to explore how I become aware that, though I’ve lived in towns all my life, there’s almost no urban imagery in my work at all. I wanted to explore why and how that might be. I’ve been very interested in the contrast between us- you are from a place and know that place intimately – I was born in one place and moved three times before I was ten. Also, my mum is from another country. I am currently living somewhere that I don’t really feel is ‘home’, but then I’m not sure where that is exactly. Another thing. A friend wrote to me yesterday about the alien nature of a place without trees, wondering how and what Autumn could mean without trees. Trees don’t engage my imagination (except in the context of axes and chainsaws)…maybe it’s the way they obstruct a view; maybe it’s all that greenery and complicated lush texture…but I understand what she meant, how her life and imaginings needed trees. So when a poet says to me that he’s not exactly sure where ‘home’ is, I’m engaged. Which, with a bit of luck, may bring me to the second thing; it started with a conversation I had with Roy at an open mic. in Hebden Bridge where he was guest poet. We were talking about poets we like (or not) and had no problem about agreeing on our mutual enthusiasm for Julie Mellor and Kim Moore. As we chatted, we came round to a kind of view that in each of their Poetry Business winning pamphlets (Breathing through our bones and If we could speak like wolves) although there was a clear and distinct voice in each, we could not predict or anticipate, as we turned the pages, what the next poem would be like, or about. They are constantly surprising. So many collections (and this is not a negative point) will have at least some thematic element or clear thread of linking narrative. It may be how a lighthouse keeper’s daughter learned to read, or the story of Van Gogh’s paintings, or the progress and failure of a love affair, or the slow death of a parent, or the history of a valley, or…you know what I mean?. It was at this point I said to Roy: you know what? the ‘surprising’ thing? that’s what I like about The sun bathers. Which is Roy’s first full collection. Roy Marshall was born in 1966. His mother was born in Italy, his father in London. Roy wanted to be a writer as a child and young man but became distracted for about twenty years during which time he found himself variously employed as a delivery driver, gardener and coronary care nurse, amongst other occupations. His pamphlet ‘Gopagilla‘ was published by Crystal Clear in March 2012 and was very favourably reviewed by Andrew McCulloch in the TLS. ‘Gopagilla’ has sold out and is no longer available. 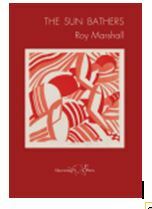 A full collection ‘The Sun Bathers’ was published by Shoestring Press in November 2013 and has been shortlisted for the Michael Murphy award. The book has also been received very positively in ‘The Warwick Review, ‘Under The Radar’, ‘The North’ and elsewhere. You can buy a copy by clicking on the ‘Sun Bathers’ page of his poetry blog. at http://roymarshall.wordpress.com/. He goes on to say something that I think might throw a small light on that element of unpredicability you encounter in successive poems, the way there’s no driving ideology or thematic urge, but instead an abiding curiosity, which might just be the clear-eyed curiousity of the outsider. “…… you might say that I didn’t start reading or writing poem really s seriously or sending any out until I was in my thirties- I think this helped- I had something to write about. Also I had little education in English (unless you count an e grade at A level in the early eighties) and this probably helped a little as no-one was telling me what I could or should do, either in terms of writing or ‘going for it’ submissions wise- my first published poem was in The Rialto, my second came third in the Ledbury poetry comp. I’ve been really lucky (my publisher, John Lucas read my Crystal Clear pamphlet and asked if I had any more poems as he’d like to publish a bookfull!) but I also worked really hard, reading, writing, drafting- and ‘catching up’ on the gaps in my knowledge. Among other things poetry has educated me as I’ve pursued ideas and words and looked things up, and on a more basic level I’ve learned to spell and punctuate properly in the last few years- at school I was the youngest in the year and gazed out of the window a lot. in an empty Victorian nursery. First I liked, a lot, the elision of the zoetrope’s imperfectly synchronised moving image with the flick/flick of something seen from the windows of a fast train. It seems to me exactly right. I like the exactness of verbs: interloping, strokes, transfixed. I like the simple honesty of it all. I can’t tell. It comes without the knowing self-deprecation of that line of Larkin’s that I’ve never liked, in a poem that I love: someone should know. And finally, that image of the poet, alone, transfixed, not knowing, being involved and ‘outside’, simultaneously. It’s a beautifully crafted poem, I think. The next poem Roy sent me I’d have chosen any way for its precise lyricism and that one word ‘birl’. And for the surprise of that ‘guillotine’. Love that. glass, in a trellis slung from the hips of a rose. your weather-cured shoes, still two sizes too big for me. Nick Drake wrote of Roy’s first pamphlet: ‘Absolutely fresh, surprising, precise, concise, vivid, moving.’ I think all those qualities are in this deceptively simple-seeming poem. Finally, one that strikes a completely different note, in the way that I like about the collection, and in the way we’d talked about at that open mic. in Hebden Bridge. lifted on diesel breeze whenever a lorry went by. tenderly placed beside rib rack and loin. for voices over the refrigerator’s hum. or, as Tim Love wrote: these are ” … the sort of poems that are easy to read yet hard to write” . I’d add one word to that. Apparently easy to read. Hello lovely John, thanks for this- I was able to read it in the e-mail (thank you thank you) but thought i ought to let you know I couldn’t open the link either from here or on Facebook- It might be my dodgy computer. A pleasure, Elly, and a pleasure, too , to read your Facebook posts.